“When they have a choice, people will always gravitate to those rooms which have light on two sides, and leave the rooms which are lit only from one side unused and empty”. Why is this? Alexander does point out that his own experimentation, from which he drew his conclusions, was rather informal. But the phenomenon is very real. What is it about certain patterns of light that attract people or enhance space and volumes effectively? There are several probable reasons why a room or space with lit on two sides (bilateral daylighting) is more successful than one with light only from one side. Firstly, bilateral lighting instinctively feels more natural. 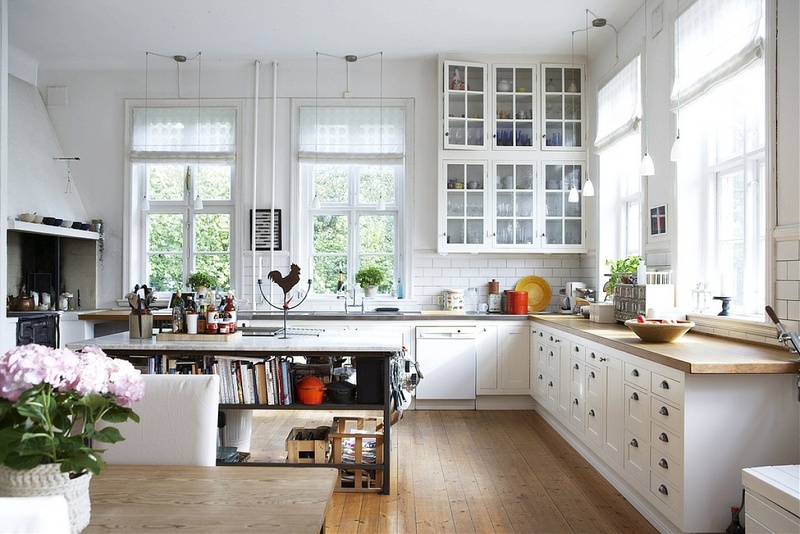 Balanced light – light coming from more than one direction – is more akin to natural light. In the great outdoors we have both direct sunlight and light from the sky itself – light coming from all different directions. This helps provide depth, giving us clear information about shapes and forms. A strong light source from one direction tends to flatten our views, providing less visual information. Balanced light – light coming from more than one direction – is more akin to ‘natural’ light. In the great outdoors we have both direct sunlight and light from the sky itself – light coming from all different directions. This helps provide depth, giving us clear information about shapes and forms. Another reason could be related to brightness and contrast ratios. Take for example the case where one is engaged in conversation in a room lit by a single window, without the benefit of natural side lighting. Because that person’s face is in harsh contrast, it’s more difficult to see facial expressions, giving us considerably less information about their mood or response. This in turn is thought to induce some amount of psychological discomfort, which we in turn project into feelings about the room itself. The third culprit is glare. The Illuminating Engineering Society of North America [IESNA] identifies glare as two sensations, disability glare and discomfort glare. Disability glare is defined as “the effect of stray light in the eye whereby visibility and visual performance are reduced”. Discomfort glare is defined as “glare that produces discomfort. It does not necessarily interfere with visual performance or visibility”. Researchers know that the relative location of a light source is a factor contributing to discomfort glare. In the present example, the high contrast between the window aperture and the surrounding surfaces is much higher in a unilaterally lit room than one which is bilaterally lit. The direct impacts of glare are eyestrain and discomfort. Indirect physiological impacts of glare can include red and itchy eyes, headaches, gastrointestinal issues, and fatigue. 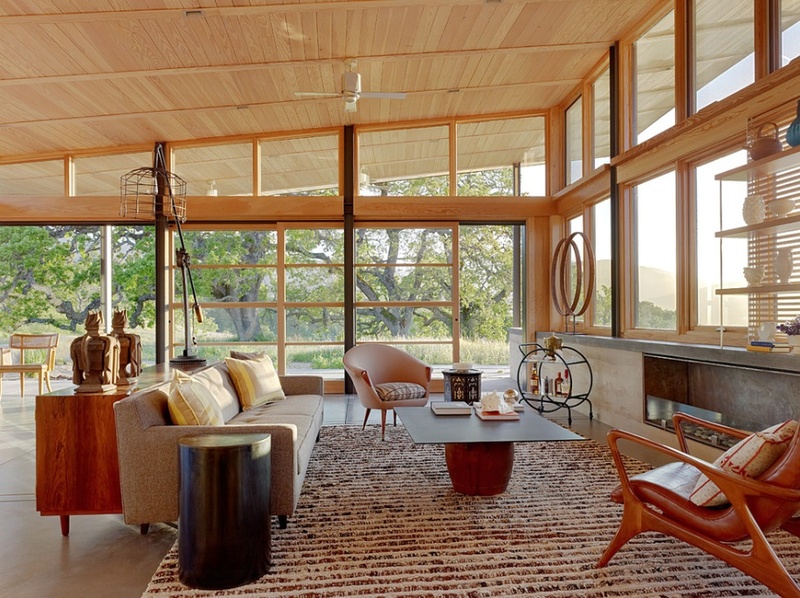 The arrangement of daylight in a room, and the presence of windows on two sides, is fundamental. If you build a room with light on one side only, you can be almost certain that you are wasting your money. People will stay out of that room if they can possibly avoid it. Of course, if all the rooms are lit from one side only, people will have to use them. But we can be fairly sure that, they are subtly uncomfortable there, always wishing they weren’t there, wanting to leave – just because we are so sure of what people do when they do have the choice. This entry was posted in Santa Cruz Architect and tagged architectural design, architectural theory, architecture, creativity, design, design theory on December 23, 2014 by santacruzarchitect. 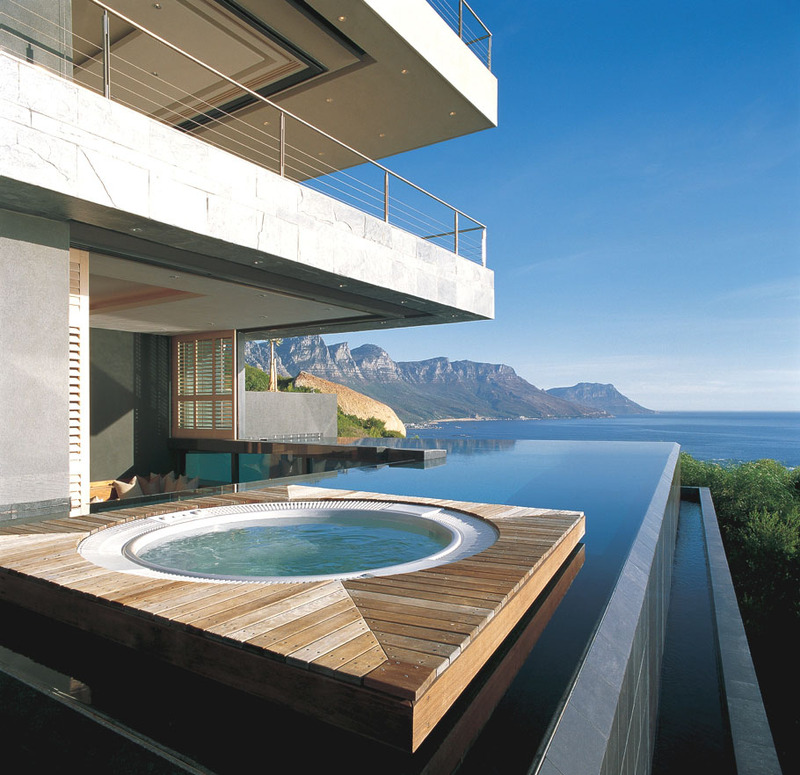 An infinity pool can be used to frame how your home is to be perceived from a pre-selected vantage point. Our firm was recently commissioned to design a significant remodel for a residential client whose brief included, notably, an infinity pool. 1. Think of the pool as framing a picture. 2. Locate the pool to enhance your key view. 3. Use the pool to conserve energy. 4. Consider it’s form and materials carefully. 5. Make the pool a practical asset. Utilize your infinity pool as part of your kit of parts to frame and enhance how your home will be perceived from a distance. For example, the pool will lend more grandeur if placed as part of the entry promenade as opposed to being placed in the back yard. Similarly, it will have an entirely different effect located on the sunny south side of the home as opposed to the shadier north side. While it may or may not turn out to be practical to locate the pool on the entry side or even the sunny side of the home, the option should at least be identified and considered within the context of other factors informing its ultimate placement on the site. 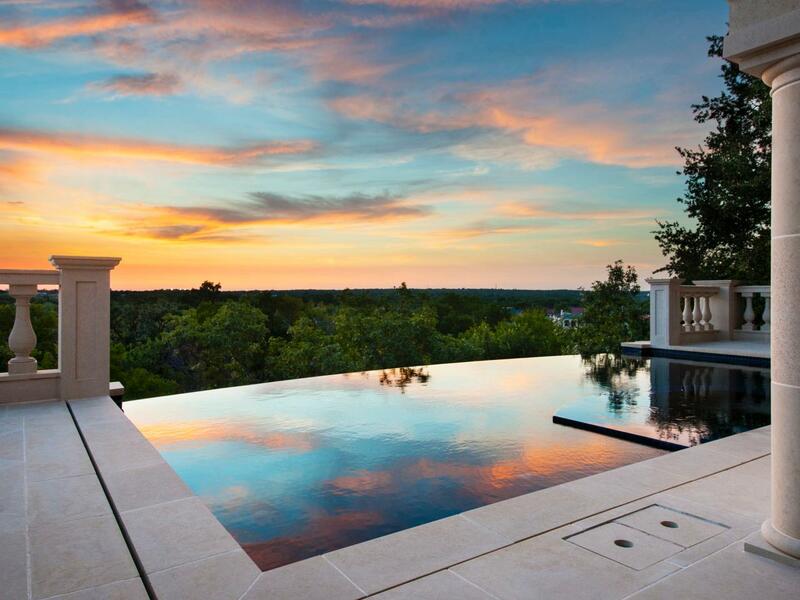 An infinity pool can be a powerful tool to frame and enhance a primary view. You must decide first which is the key view from the perspective of looking outward from the site. Some sites are fortunate to have several views from which to choose – if such is the case, it’s all the more important that you evaluate them carefully. List them, with the one most important to you at the top of the list, and secondary views farther down the list. The view at the top of the list is the one to be emphasized as your key view. Next, choose which room or rooms are to be oriented towards your key view. Is it to be the living room, the dining room, the master bedroom, or all of the above? Once these decisions are made it becomes a relatively simple matter to decide where within your key view shed the infinity pool is to be placed. 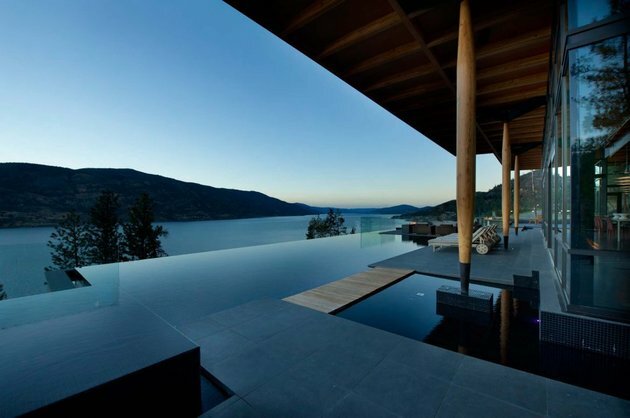 Thinking of the pool as a vast horizontal mirror, its surface can powerfully reflect and magnify your key view. An infinity pool can be a practical asset when it comes to conserving energy. As a reflective surface, if placed advantageously the pool can be used to direct additional solar energy in the form of sunlight, thereby reducing the home’s energy demand in terms of lighting. In hot climes or on hotter days in more temperate climates air cooled by the pool can be used for cross-ventilation as part of a strategy of passive solar cooling for the home. The materials used to construct the pool and surrounding decks should complement those utilized in the home’s exterior. Your pool’s form and geometry will need to complement the style of the home itself. A rectilinear, orthogonal pool will always complement a home designed in the modern style – it may not necessarily enhance a home designed in, say, French Country style. A curvilinear pool will lend itself to some architectural styles and not to others. So too, the materials selected in the design of the pool will need to match or at least complement those selected for the exterior of the home itself. As a recreational feature, your infinity pool’s function is not simply to enhance your home aesthetically – it’s also your place for swimming! While sorting through all the other factors informing your pool’s design, its crucial not to loose track of what makes a good swimming pool. Locating the pool for good solar access is essential – nobody wants to swim in a shaded pool! This means that the pool’s relationship to both nearby trees and the house itself need to be carefully considered: neither element should be permitted to cast a shadow on the pool while it’s in use. For the sake of comfortable access it’s best to locate the pool closer to the home rather than farther away. This is actually an added advantage in terms of most of the best practices described earlier. A pool positioned closer to the home will serve better to capture and reflect distant views than one farther away, and a pool placed nearer the home will be much more effective in bouncing daylight into the interior than one farther away. Finally in terms of practicality, the pool must lend itself to a strong sense of privacy if its usefulness is to be fully realized. Enclosing it to some degree with building elements, privacy fences or landscaping – placed carefully so as not to compromise the other best practices described earlier – will be critical to the design of the successful infinity pool. This entry was posted in Santa Cruz Architect and tagged architectural design, architectural theory, architecture, creativity, design on December 16, 2014 by santacruzarchitect. Architect/theorist Christopher Alexander conceptualized Pattern #117: Sheltering Roof in his 1977 book, A Pattern Language. 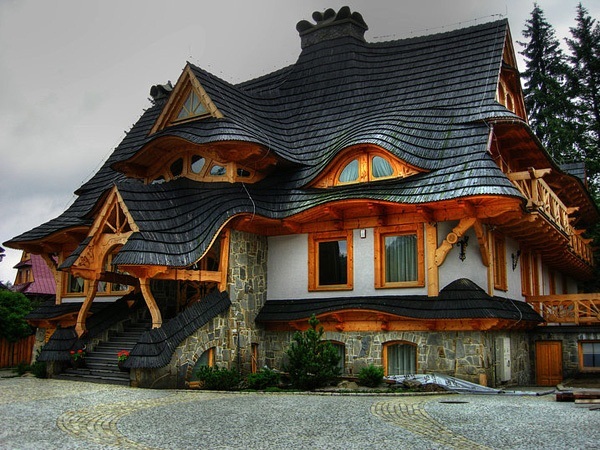 Alexander identified that the most fundamental and archetypal element defining a home is it’s roof. More fundamentally, if the roof cannot be felt visually around the home it’s not nurturing, doesn’t satisfy the psychological need for shelter. The roof shelters us when it embraces, covers and surrounds the process of living. Alexander’s insight is that we must make the entire surface of the roof visible, bring the eaves low at gathering places like entries to lend human scale, and build the top story of the building right within the roof. A strong sense of shelter is probably the most important aesthetic requirement of a work of architecture. But the roof is a sadly neglected element of the vast majority of works being designed today. When the roof is emphasized in contemporary work it is all too often an over-stated “look how big and expensive I am” exaggeration rather than an authentic expression of the nature of shelter-making and security at the subconscious, visceral level. House number 8, Blaise Hamlet, England a.k.a. 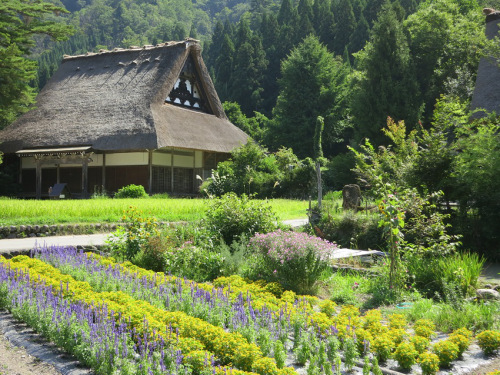 “Circular Cottage”. Neither a large roof nor prominent overhangs by themselves can be sufficient to the task of providing a sense of shelter. The roof, instead, must be an integral to the living spaces which must exist beneath and within the roof itself. 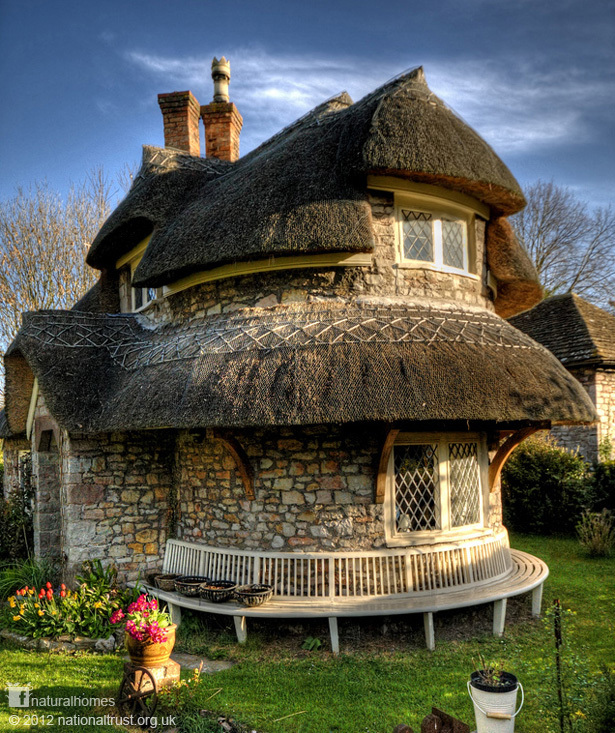 “Circular Cottage” (right) is a rubble stone lime mortar thatched cottage in Blaise Hamlet near Bristol, England. It was designed by John Nash, master of the picturesque architectural style and designer of, among others, Buckingham Palace in London. The cottage, along with the rest of the hamlet, is owned by the UK’s National Trust. The home also demonstrates other timeless patterns making it emotionally attractive such as No.116 ‘Cascade of Roofs’, No.239 ‘Small Panes’, No.242 ‘Front Door Bench’ and No.231 ‘Dormer Windows’. 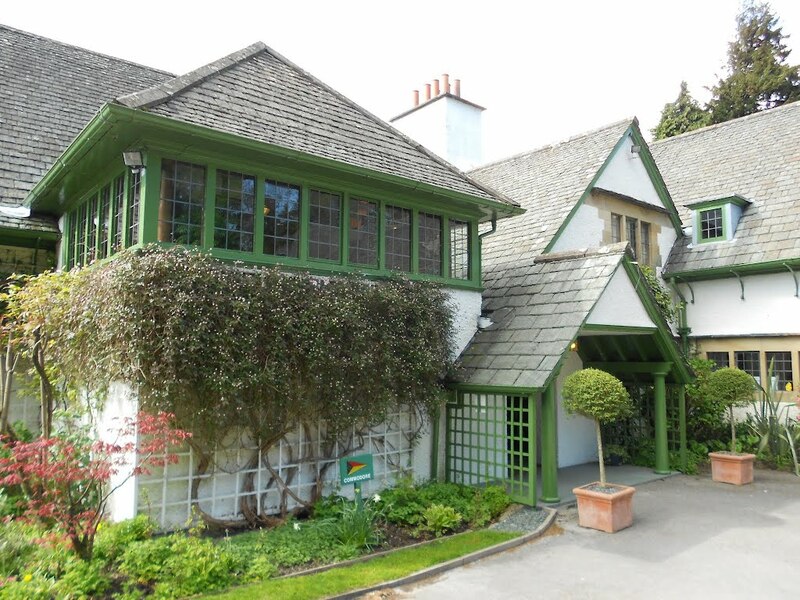 Entrance to Broadleys House, Windermere. Charles Voysey architect, 1898. In each of these examples, although the location, historical era, scale, and style of the home are vastly different, the concept of a shelter-giving roof is not. In each, the roof is a major visual element of the building when seen from a distance. In each one lives within the roof at the upper floor, it flow gently downward to greet us at the entry, and projects strongly outward to provide the necessary sense of comfort and reassurance, all tests of a successful sheltering roof. This entry was posted in Santa Cruz Architect and tagged architectural design, architectural theory, architecture, creativity, design, design theory on December 10, 2014 by santacruzarchitect.